We want to know when it’s your birthday! Let us know by commenting on our post pinned to the top of our facebook page OR send us a facebook message by going to facebook.com/hot973. 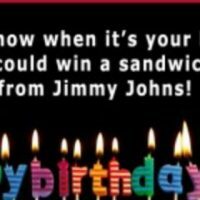 We’ll announce your birthday on the radio and THEN enter you to win a sandwich platter from Jimmy Johns in Burlington, Iowa. We will pull one winner each week so don’t miss out! Let us know when you’re celebrating and get a chance to win, with the Jimmy John’s Birthday Party and Hot973.